The name of this British composer (1912-1972) is very little-known but he was a truly fine composer whose music embraces opera, symphonies, concertos, chamber music and solo piano music. Roger Sacheverell Coke (his name is pronounced 'Cook') suffered from several medical conditions throughout his life, and although he appeared in public as a composer, his innate shyness and diffidence, coupled with his uncertain health, caused his music to become unfairly overlooked. But Coke was a friend of Rachmaninov, to whom Coke dedicated his Second Symphony, and Rachmaninov often visited Coke in his North of England home when he was in this country. There's a feel of Rachmaninov's Romanticism in Coke's own music, and as he played much of it himself, you can hear just what a splendid pianist Coke must have been. His musical language appeals to those who admire Rachmaninov and the great Romantic tradition, yet for those who have taken the trouble to find and study it, it has its own language. 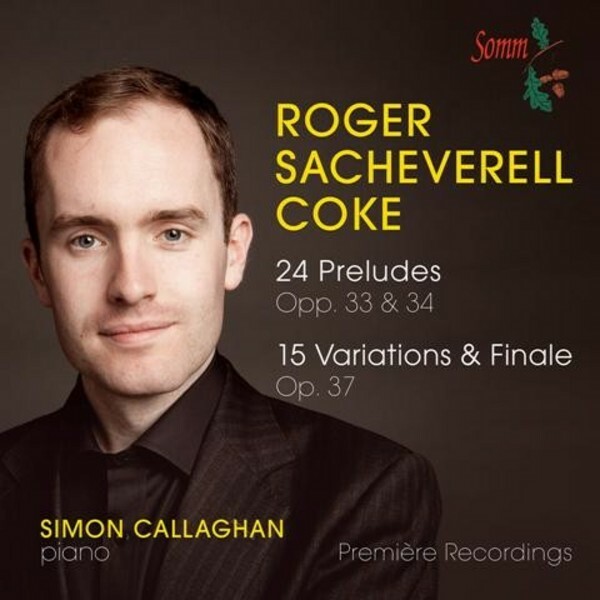 Simon Callaghan has made a special study of this scandalously neglected composer, whose music is gradually coming to be rediscovered, and this well-filled CD contains two of Coke's major piano works - the 24 Preludes and the very fine Theme and Variations. Callaghan's own pianism on this disc is in the highest class. Winner of the Prix Sp�cial in the 8�me Concours Jean Fran�aix in Paris, the British pianist Simon Callaghan has established a busy international career as a concert pianist. He is currently Artistic Director of Sunday Concerts at the renowned Conway, Hall, London. "What a wonderful pianist, who combines complete understanding of the style of music he is playing with a rare subtlety and brilliance of execution." Sir Roger Norrington.